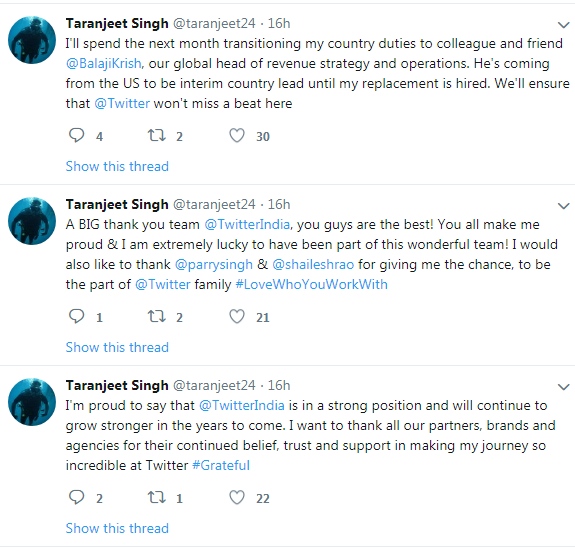 Taranjeet Singh, the man behind the growth of the business of Twitter in India has stepped down from his position as Country Director. This announcement was tweeted by him on the microblogging website on Tuesday. Following the stepping down of Taranjeet Singh, the company’s Twitter’s global head of revenue strategy and operations Balaji Krish will take over the position of the latter. He is coming from the US to be interim country lead from the next month. Singh started his journey with Twitter in 2015 by joining the social media platform’s India office as Business Head and led the charge for sales and marketing support for Twitter’s advertisers in India. Soon in 2017, he was promoted to the role of Country Director for Twitter India. During is work period at the company, he helped double the user base in India for Twitter to nearly 30 million users. Prior to joining Twitter, Singh spend close to a decade with BBC as head of advertising and Sales Director of South Asia. Here we have some other tweets from Taranjeet Singh. As compared to Facebook and Whatsapp who have been involved in many controversies regarding spread of misinformation on its platform, Twitter India has always had a good image. Singh stated that Twitter India is in a strong position and will continue to grow stronger in the years to come.